Nathan Chen performs his Free Skate at the 2019 Geico U.S. National Figure Skating Championships. 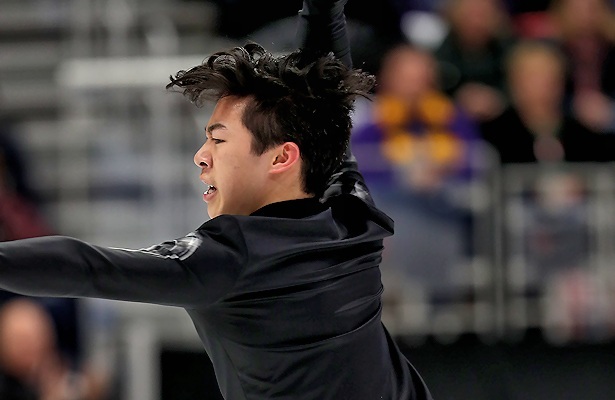 Chen became the first man to win three-consecutive U.S. titles since Johnny Weir did so from 2004 to 2006. The world champion landed four solid quads in his routine to “Land Of All” by Woodkid: a Lutz, flip, toe, and toe in combination with a triple toe. He was also landed six triple jumps while displaying level 4 spins and footwork, earning many high grades of execution (GOE) on all elements along the way. Chen’s free skate totaled 228.80 points to give him a combined 342.22, well ahead of Zhou’s 183.76 and 284.01, as well as Brown’s 172.56 and 273.08. Zhou’s long program to the soundtrack of Crouching Tiger, Hidden Dragon began with an excellent quad Lutz-triple toeloop combination, however, he then under-rotated a quad flip and a quad Salchow before downgrading a quad toeloop. However, he landed two solid triple Axels and earning level 4s on elements. Brown doubled his opening planned Salchow, but recovered to a land a solid triple Axel-triple toe in his routine to a Simon and Garfunkel medley. The skater popped another Salchow, but landed five more triples, showing strong footwork and spins throughout. The 2015 U.S. champion, Brown also won bronze in 2017 and moved to Toronto to train with Tracy Wilson and Brian Orser last year. Tomoki Hiwatashi wound up with the pewter medal in fourth place with a free skate of 169.23 and an overall score of 253.28. The 18-year-old under-rotated his opening quad Salchow (in combination with a triple toe) and put a foot down on the landing of a triple Axel in his routine to “Fate of the Gods.” Despite the mistakes, he still landed a clean triple Axel-double toe, as well as five more triples, displaying level 4 spins and footwork throughout. Aleksei Krasnozhan finished fifth with a 151.99 free skate and 234.52 combined, followed by Timothy Dolensky and Andrew Torgashev. The top three men earned a trip to the upcoming World Championships. Brown, Hiwatashi, and Zhou were selected for the Four Continents next month.